Do you like to ADB? Lets face it we all have been there , trying to fiddle with managing our emulators and dev devices. And at max we would do is try to manually manage it. Let me make this clear I am not talking about tests here as that’s all related to the code. My focus here is on managing the device/emulator that’s paired with your dev environment/system (..and to your IDE - Android Studio , if you still use Eclipse you are simply oblivious to the joys of coding in Android [here is a long blank stare from me to you] ). Technically there is a tool called ADB (Android Debug Bridge) which maintains your connection with your device/emulator and the dev environment/system. Manage the state of an emulator or device. Run shell commands on a device. Manage port forwarding on an emulator or device. Copy files to/from an emulator or device. Ohhk… that sounds something of use but not convincing enough for you to try and play with it yet. Let me try and put forward some of the problem as a dev you are facing everyday (..and yet no one admits to them whenever it comes up in a conversation 🙄..) and how can we solve this. Oh yeah ..you are used to hitting Run in the IDE (or the keyboard shortcut for the same) and BOOM the apk installs in the device. But what do you do to uninstall the apk ? [Rolling eyes] ohh yeah I know ..you will open up your device/emulator and manually uninstall the app by dragging it to the trash bin in the home screen and hit yes when prompted to uninstall it. Hard ain’t it ? Yeah it is. Easy you say, right ? Like you can just fire up your Android Studio and execute the app in some specific device. For our example here let’s assume we have like 3 devices and 2 emulators running, named as device_1, device_2, device_3, emu_1, emu_2. But we wanna go a step ahead and orchestrate commands in a pattern (..by writing a bash script, obviously). But to do that I need to specifically direct commands to the device I want to control. where <some_command> does not have to be the same. execute it by running ./execute_cmds_as_symphony.sh. Read my post “Life without wires : ADB over WiFi” to learn how to set it up. There are times when the device would not show up in your IDE. Possible issue could be that adb is not responding. To fix that simply kill the server and start it again. 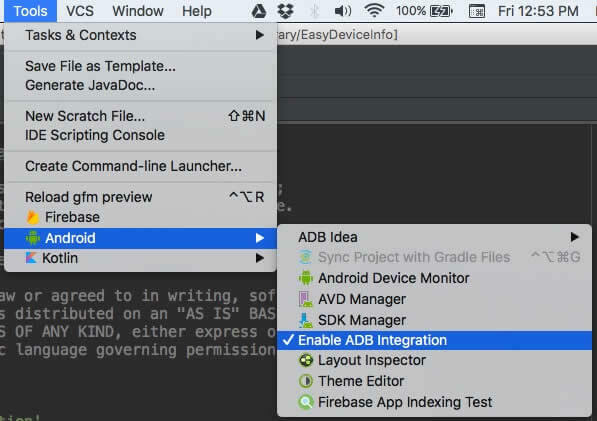 I have seen that you also need to uncheck and then check ADB Integration inside Android Studio as an extra step. You can advocate about trying to copy files from your device by opening up some software and then dragging and dropping things onto your desktop. But I am fan of automating things and the above mentioned method is completely fine if you are doing that for one file and only once or twice. It changes when you wanted to do the same task again and again. When you want to automate things adb commands come in handy. You can even add them to a script and run it every time one of the task completes. The private key is stored in <file>, and the public key is stored in .pub. Any existing files are overwritten. Of Course this is inbuilt into the IDE , but its worth knowing that it’s not just a window which you use in Android Studio, but so much more. # Writes log message output to a file. The default is the "stdout - Standard Output"
A few people would say that we can always use | grep "filter_text" appended to the adb logcat. Well you are right you can , but there are some neat tricks hidden in the actual implementation of logcat and you should look at them too. When filters are provided, the “logcat” command will dump log entries that are generated from specified processes with priorities higher than the specified code, plus all log entries that generated from unspecified processes. If you would like to get more of such android tips and tricks, just hop onto my Android Tips & Tricks github repository. I keep updating it constantly.